This one contains Sylvain rabbit and carrot seeds, but there are four other varieties available including Felicie hen and sunflower seeds, Nini mouse and poppy seeds and Perlette frog and pumpkin seeds. Such lovely little cuties - though what excuse could I use?? Mmmmmm....must go and think. Humphrey's hair is looking particularly cool these days. I can imagine how exciting a grow your own carrot kit is for Humphrey. What a cutie he is. Humphrey looks a little TOO interested in that package ! CArrots, lettuce, kale, chard, parsley, cilantro, ... get it going!!! Thanks for visiting my blog, after me visiting yours! 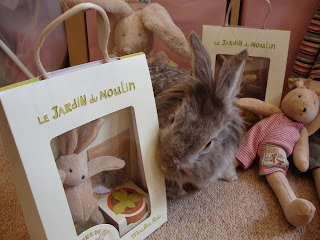 Humphrey looks like he might be a bit partial to the carrot growing kits. Hope he didn't think the packaging was edible!